In a recent post, I listed some of the early use cases described in the first meetup dedicated to Ray—a distributed programming framework from UC Berkeley’s RISE Lab. A second meetup took place a few months later, and both events featured some of the first applications built with Ray. On the development front, the core API has stabilized and a lot of work has gone into improving Ray’s performance and stability. The project now has around 5,700 stars on GitHuband more than 100 contributors across many organizations. At this stage of the project, how does one describe Ray to those who aren’t familiar with the project? The RISE Lab team describes Ray as a “general framework for programming your cluster or cloud.” To place the project into context, Ray and cloud functions (FaaS, serverless) currently sit somewhere in the middle between extremely flexible systems on one end or systems that are much more targeted and emphasize ease of use. More precisely, users currently can avail of extremely flexible cluster management and virtualization tools on one end (Docker, Kubernetes, Mesos, etc. ), or domain specific systems on the other end of the flexibility spectrum (Spark, Kafka, Flink, PyTorch, TensorFlow, Redshift, etc.). Figure 1. Examples of libraries that can be built on top of Ray. Source: Robert Nishihara and Philipp Moritz, used with permission. 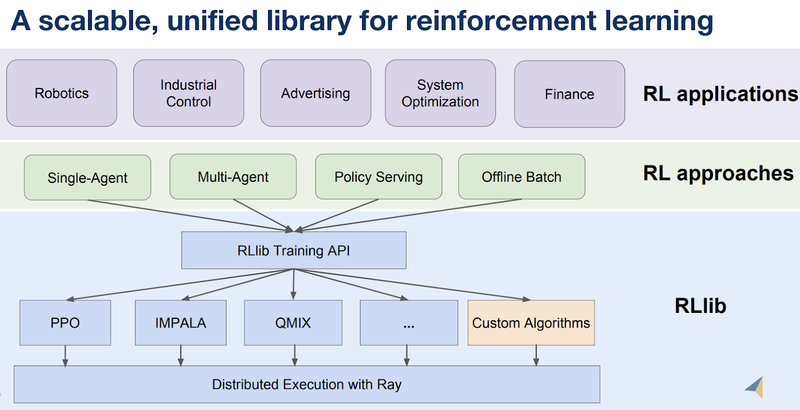 Libraries on top of Ray are already appearing: RLlib (scalable reinforcement learning), Tune (a hyperparameter optimization framework), and a soon-to-be-released library for streaming are just a few examples. As I describe below, I expect more to follow soon. Modin lets you scale your pandas workflows by changing one line of code. Given that many data scientists already love using pandas, Modin is an extremely simple way to scale and speedup existing code. Scalable data science: It has not gone unnoticed that Ray provides a simple way for Python users to parallelize their code. At a recent UC Berkeley course—Data Science 100—co-taught by one of the creators of Jupyter, Ray was the focus of a lecture on distributed computing. Reinforcement learning (RL): RL is one of those topics that data scientists are beginning to explore. But just as many machine learning users take advantage of existing libraries (e.g., scikit-learn), most RL users won’t be writing libraries and tools from scratch. The good news is that RLlib provides both a unified API for different types of RL training, and all of RLlib’s algorithms are distributed. Thus, both RL usersand RL researchersbenefit from using RLlib. Figure 2. Reinforcement learning and Ray. Source: Eric Liang, used with permission. AutoML: In a recent post, we described tools for automating various stages of machine learning projects—with model building being an important component. Ray users can already take advantage of Tune, a scalable hyperparameter optimization framework. Hyperparameter tuning is a critical and common step in machine learning model exploration and building. There are also other AutoML projects that use Ray, and hopefully some will be released into open source in the near future. Companies exploring the use of Ray for real-time recommendation systems—which involves learning models against live data. There are also a growing roster of research groups in AI, machine learning, robotics, and engineering that have adopted Ray. With Ray beginning to be available on cloud platforms—Amazon SageMaker RL includes Ray—I expect to hear of many more interesting case studies involving Ray. In closing, this is a great time to explore Ray. The core API is stable, libraries are improving and expanding, more production deployments are emerging, and (most importantly) the community of users and contributors is growing.